Officers at the scene. Photo by Eddie Mitchell. A man has been arrested on suspicion of murder this afternoon. At about 12.41pm on Thursday (27 July), police were called to an incident in Clyde Road, St Leonards. Once at the scene further enquiries led to the discovery of a 37-year-old local man with serious injuries in Wishing Tree Road. Despite the best efforts of paramedics, the injured man was pronounced dead at scene, police said. A section of the street has been closed off while forensics investigations are carried out, police say. Police say a 21-year-old man from London was arrested in Clyde Road on suspicion of murder. He remains in police custody at this stage. 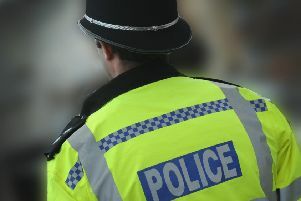 Police are not looking for anyone else in connection with the incident, however anyone with any information is asked to report it online at https://sussex.police.uk/appealresponse quoting Operation Lexus.